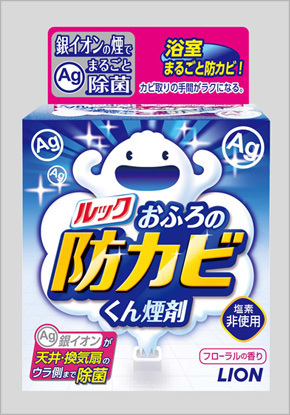 Lion Corporation (President: Itsuo Hama) announced today the nationwide release of LOOK Bath Antimold Fogger on Wednesday, September 26, 2012. 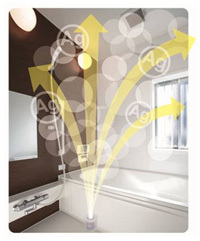 This new fumigation-type fungicide uses smoke-like silver-ion fog to kill black mold and its spores throughout the bathroom and prevent them from growing back. According to a Lion survey, consumers are repulsed by bathroom mold, with 95% indicating that it looks disgusting and 88% commenting that they worry about the negative effect on their family’s health. However, consumers also consider cleaning the bathroom with fungicides to be burdensome because of the harsh odor, the need for gloves and fear that such products can be harmful to one’s health. Consequently, many consumers delay cleaning off bathroom mold until it becomes noticeable, despite being repulsed by it. In addition, 46% of respondents indicated that no matter how much effort they put into cleaning off mold, it cannot be remove completely, while 57% complained that mold grows back soon after cleaning. Accordingly, the level of satisfaction concerning mold removal remains extremely low at 7%. Conventional mold removal methods are very troublesome yet must be repeatedly used as mold keeps growing back. ■The cause of black mold, which grows back after repeated removals, is hidden on the ceiling. Lion’s Living Care Research Laboratories has discovered that “invisible mold spores,” which hide on and around the bathroom ceiling, causes black mold to grow back even after repeated cleaning. From the ceiling where they grow, invisible mold spores spread throughout the bathroom, causing visible mold to return immediately after being cleaned away. ■Lion has developed smoke-like silver-ion fog, a newly developed technology that kills the spores that cause black mold to grow throughout the bathroom and prevents them from returning. In order to prevent mold from returning, every black mold spore hidden throughout the entire bathroom (including ceiling and behind ventilation fans) must be killed. In response, Lion has developed a new technology that uses fog to deliver the sterilizing agent, silver-ions, to every corner of the bathroom in order to kill black mold spores. Lion will release LOOK Bath Antimold Fogger, a fumigation-type fungicide that offers a new way to alleviate the burdens of cleaning off bathroom mold by preventing it from growing back. The sterilizing smoke-like silver-ion fog is able to reach the ceiling and behind ventilation fans to kill each and every black mold spore. (2) LOOK Bath Antimold Fogger impedes the growth of black mold, making cleaning a breeze. Using LOOK Bath Antimold Fogger impedes the growth of black mold and thus allows users to clean less frequently while reducing the burden associated with cleaning with fungicides. (3) Regular use increases the effectiveness of silver ions. Using LOOK Bath Antimold Fogger once every one to two months increases the effectiveness of silver ions’ mold prevention capabilities. Therefore, ongoing cleanliness can be maintained simply through ordinary cleaning with bathroom detergents and without the need for fungicides. *Removing small items and toys from the bathroom prior to use is unnecessary. · Fumigating for over 90 minutes will sterilize the entire bathroom, completely killing mold and spores. *Washing surfaces in the bathroom with water after use is unnecessary.